The ultimate performance sport sandal with elasticized criss cross instep adjustment for precise easy fit. Featured in various color and materials that resists water while allowing air flow to refresh the foot. Includes durable all natural Latex outsole for maximum shock absorption and comfort. Heel height - 1.25 inches. Arche shoes, the ultimate in authenticity. For 40 years, Arche has been assembling its designer shoes, boots, sandals and handbags by a team of crafts artisans in the Chateau Region of France not far from Paris. Every pair of Arche shoes are hand crafted to perfection with the goal of providing the absolutely best product possible. 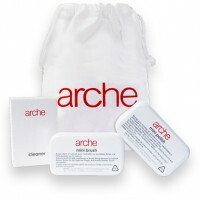 Arche brings you a rich and inviting color palette gathered from the latest fashion trends. Arche begins with the belief that Black and Brown do not go with everything. Every Arche Collection of shoes, boots and sandals are then offered in a myriad of colorations that correspond exactly to fashion enabling our customer to always look her best. All Arche shoes, boots and sandals feature 100% natural Latex cushioning for maximum durability, flexibility and unrelenting shock absorption. Supple water and scratch resistant Nubuck Leather repels the elements while creating a cozy and breathable home for the foot. All Arche shoes, boots and sandals provide instant comfort that will create a bounce in each step. Arche footwear is chic, comfortable and durable and does not require a maintenance program. However.. The ultimate performance sport sandal with elasticized criss cross instep adjustment for precise eas..